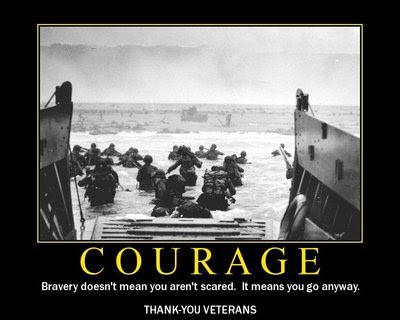 It's Veteran's Day today. How can we say thank you in a meaningful way to the men and women who sacrifice for our country? I think I'll just say thank you in the best way I know how, which means....cookies. Tonight the charges and I (with Grandma and Grandpa) will drop off cookies to our neighborhood veterans. We have some brave and noble WWII vets just around the corner. I think we'll make these and these. We'll also drop off cookies to the veteran's widows. I think they deserve it too, don't you? If you have time, whip up a batch and follow suit. Have a wonderful day and a huge, heartfelt thanks to those who fight for our freedom. BEYOND wonderful tribute - you have a heart of gold. Love that first picture, it made me teary. I agree with VeggieGirl, you have a heart of gold! What a sweet post. The cookies llok delicious. I can't wait for that tortilla soup recipe! Gave me goosebumps! Wonderful act of kindness, and even more wonderful to teach the charges the importance of today! God Bless those men and women! Ohhhhh, what a great idea to take Veterns a sweet gift! I may make that a tradition! What a great thing to do. I'm sure they loved the cookies and you for thinking about them.